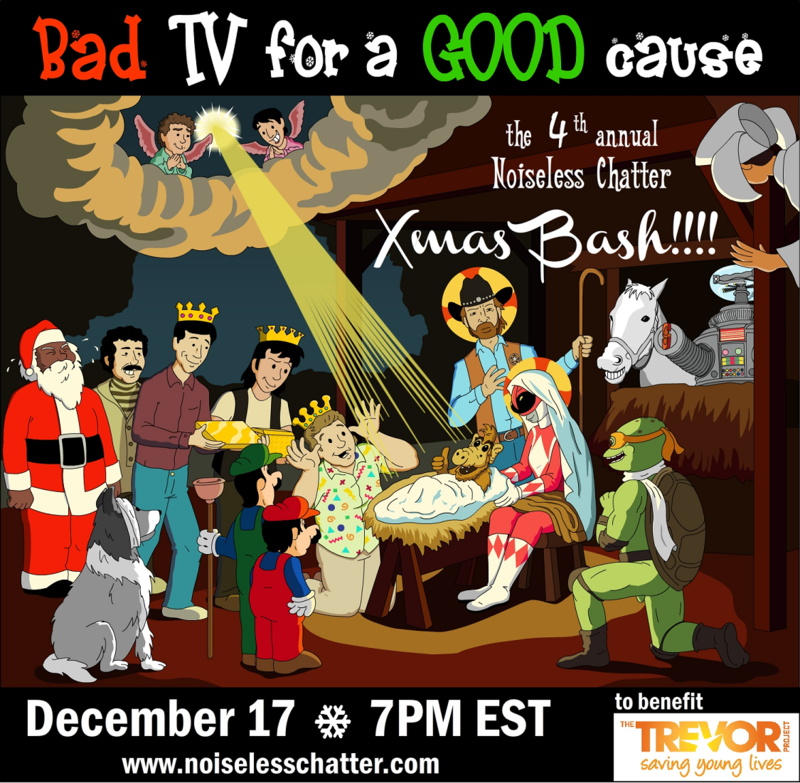 Announcing: The 4th Annual Noiseless Chatter Xmas Bash!!!! This year I wanted to announce the time and date for the Xmas Bash!!!! a bit earlier than usual. This should hopefully give everybody plenty of time to request time off at work / break up with their fiances as necessary. It’s free to attend; all you have to do is come to noiselesschatter.com at 7 p.m. on December 17. The stream itself is family friendly, so you can view it in your living room without horrifying grandma. Don’t let her see the chat room, though. That’s where the horrifying is guaranteed. As always, the stream benefits The Trevor Project. Donations are not mandatory, but we will welcome them throughout the night. If you don’t know about the Xmas Bash!!!! you can read about it here. But mainly we will be screening seven surprise Xmas specials from years past, riffing on them (and each other) in the live chat, and basically having the world’s greatest part for introverts. It’s my favorite night of the year, and it keeps getting better. This stream will be no exception. It’s one night only, so tune in for five full hours of bad TV, great people, and hilarious commentary. Check out the announcement trailer, which may jog your memories of Bashes past. And of course be sure to let me know if there’s something specific you’d like to see this year, or if any particular special/music video/other feature from the past sticks out in your mind. Will there be a repeat screening as in years previous? That’s 10am on Sunday December 18 here in Australia and I’ll be at work, and cannot get out of it (Sundays are our busiest day, being retail, and a week out from christmas means its all hands on deck). Or will a donation secure a download link? Sadly there won’t be! I did try the encore presentation last year, but, to be honest, I didn’t feel it worked very well. It split the audience into two smaller groups, and made it feel like something less of an event. It was still a great time (two great times! ), don’t get me wrong, but it’s a lot of work to get the stream going, and doing two nights took a lot out of me. If I had more time and resources I’d consider it again in the future, but for now…it’s just the one night. I do hope there’s an Xmas miracle or something that enables you to attend, though! A download link is certainly possible, but hopefully you won’t have to miss out on the chat.